•	Bring a large pot of slightly salted water to a boil. Add pasta and cook for 8 to 10 minutes or until al dente. Add carrots and broccoli for 5 minutes or less before removing pasta; drain. Preheat oven to 350 degrees F (175 degrees C). 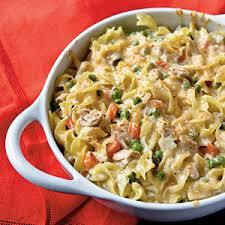 •	In a large bowl, combine pasta, carrots, broccoli, soup, tuna, celery, onion, and red bell pepper; mix all together. Place mixture evenly in a 9×13 inch baking dish, and sprinkle cheese on top. Bake in preheated oven for 20 minutes.